The La Reggia dei Principi guest house in the centre of Rome offers not only brand new romantic accommodation, but is also situated within walking distance of many of the main tourist sites and close to the metro underground stations. 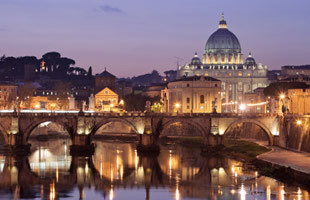 Located just around the corner from the Opera House, our value for money accommodation is positioned just 500 metres from the magnificent golden Basilica of St Maria Maggiore – one of the four papal basilicas of Rome. The Basilica of St Maria dei Angeli is also just a few minutes walk at Piazza Repubblica and the long street of Via Nazionale that runs from there is full of shops offering the latest Italian fashion. The Basilica of St Paul (5 stops from Cavour). The La Reggia dei Principi Rome is also on the edge of the trendy Roman district which is full of traditional Italian restaurants, bars, cafes and chic boutiques selling all manner of art, jewellery, clothes and objet d’ars. On the other side of this narrow district is the awe inspiring Coliseum and the Imperial Roman Forum that are also within easy walking distance from us. It is along Via Nazionale that guests can find the famous Palazzo delle Esposizioni museum and gallery and a little further one can see the Quirinale Palace – once the home of 30 popes and 4 kings but now home of the current President of the Italian Republic. 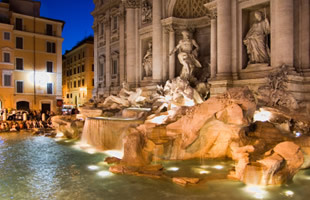 The Trevi Fountain too, this time in the opposite direction is also just a 15 minute walk away and we recommend that you see this at night when some of the crowds have dispersed. It is truly beautiful and most romantic when lit in the darkness. 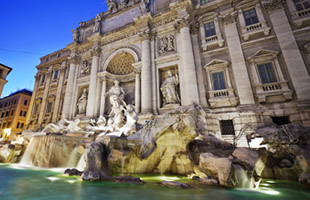 Of course there are also many attractions that are reachable by public transport rather than by foot, and the fact that we are just 450 metres from Termini Station – the transport hub of Rome means that you can reach them quickly and with the minimum of hassle. After visiting our Rooms & Services section to understand what great value for money our rooms are as can be seen from our Photo Gallery page link), then visit our online booking system to enjoy our lowest possible prices through this, our Official Site.